Chief Data Scientist/Head of Data Science, Clari, 2014 - Present. Principal Data Scientist, @WalmartLabs, 2012 - 2014. Scientist, Advertising Sciences, Yahoo! Labs, 2010 - 2012. Research Intern, Yahoo! Data Mining and Research Group, Summer 2008. Isaac Jones, Lei Tang and Huan Liu. Community Discovery in Multi-Mode Networks In User Community Discovery, Editors: Paliouras, G., Papadopoulos, S., Vogiatzis, D., Kompatsiaris, Y., Springer, 2015. Lei Tang and Huan Liu. Understanding Group Structures and Properties in Social Media. In Link Mining: Models, Algorithms and Applications, Editors: Christos Faloutsos, Jiawei Han and Philip S. Yu. Springer, 2011. Payam Refaeilzadeh, Lei Tang and Huan Liu. Cross Validation. In Encyclopedia of Database Systems, Editors: M. Tamer Ã–zsu and Ling Liu. Springer, 2009. Lei Tang, Huan Liu and Jianping Zhang. Bridging Taxonomic Semantics to Accurate Hierarchical Classification. In Encyclopedia of Data Warehousing and Mining, 2nd Edition, Editor: John Wang. Idea Group, 2008. Reza Zafarani, Lei Tang and Huan Liu. User Identification across Social Media, ACM Trans. Knowl. Discov. Data (TKDD) 10, 2, Article 16 (October 2015), 30 pages. Yi Chang, Lei Tang, Yoshiyuki Inagaki, Yan Liu. Whatis Tumblr: A Statistical Overview and Comparison, SIGKDD Explor. Newsl. 16, 1 (September 2014), 21-29. Lei Tang, Huan Liu and Jianping Zhang. Identifying Evolving Groups in Dynamic Multi-Mode Networks. IEEE Transactions on Knowledge and Data Engineering (TKDE), 2012. Lei Tang, and Huan Liu. 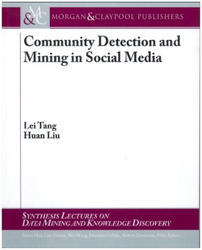 Leveraging Social Media Networks for Classification. Journal of Data Mining and Knowledge Discovery (DMKD), 2011. Lei Tang and Huan Liu. Toward Predicting Collective Behavior via Social Dimension Extraction. IEEE Intelligent Systems, vol.25, no.4, pp.19-25, July-Aug. 2010. Shuiwang Ji, Lei Tang, Shipeng Yu and Jieping Ye. A Shared-Subspace Learning Framework for Multi-Label Classification. ACM Transactions on Knowledge Discovery from Data (TKDD), vol 4, issue 2, 1-29, 2010. Lei Tang, Huan Liu, Jianping Zhang, Nitin Agarwal and John Salerno. Topic Taxonomy Adaptation for Group Profiling. ACM Transactions on Knowledge Discovery from Data (TKDD), vol 1, issue 4, 1-28, 2008. Xufei Wang, Lei Tang, Huiji Gao, and Huan Liu. Discovering Overlapping Groups in Social Media. In Proceedings of The 10th IEEE International Conference on Data Mining (ICDM'10), 2010. Lei Tang, Huiji Gao, and Huan Liu. Network Quantification Despite Biased Labels. In Workshop on Mining and Learning with Graphs, KDD 2010. Lei Tang, Xufei Wang, Huan Liu and Lei Wang. A Multi-Resolution Approach to Learning with Overlapping Communities. In Workshop on Social Media Analytics, KDD 2010. Lei Tang, Geoffrey Barbier, Huan Liu and Jianping Zhang. A Social Network Analysis Approach to Detecting Suspicious Online Financial Activities. In Proceedings of International Conference on Social Computing, Behavioral Modeling and Prediction (SBP'10), pages 390-397, 2010. Lei Tang. Collective Behavior Prediction in Social Media. In Doctoral Student Forum, SIAM International Conference on Data Mining (SDM'09), 2009. Payam Refaeilzadeh, Lei Tang and Huan Liu. On Comparison of Feature Selection Algorithms. In Proceedings of AAAI Workshop on Evaluation Methods for Machine Learning II (AAAI'07), pages 34-39, 2007. Ronglu Li, Xiaopeng Tao, Lei Tang and Yunfa Hu. Using Maximum Entropy Model for Chinese Text Categorization. In Proceedings of the 6th Asia Pacific Web Conference (APWeb'04), pages 578-587, 2004. Lei Tang. Learning with Large Scale Social Media Networks, July 2010. Thesis Committee: Huan Liu, Subbarao Kambhampati, Pat Langley and Jieping Ye. Dr. Vijay K. Narayanan, Yahoo! Inc.
Dr. Suju Rajan, Yahoo! Inc.